Heuristic in Math – Draw a diagram and The Model Method. (Grade 1 to 3) focus on the problem solving heuristic through meaningful and challenging practices. Students nowadays need to learn how to tackle unfamiliar and complex math questions. There are many strategies that students learn to make them a successful problem solvers. 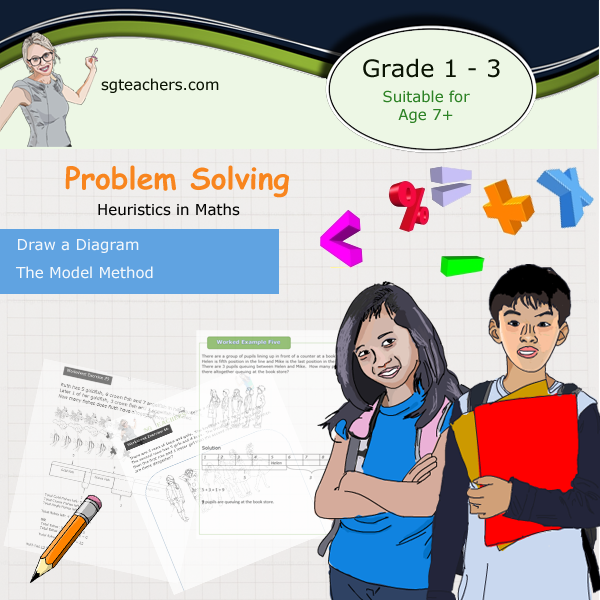 This book focus on two of the key strategies used in mathematical problem solving which are “Draw a diagram” and “Model method”, which is renowned as Singapore Math. The main purpose of drawing a diagram and model method is to visualize which is crucial to comprehend the questions and how the mathematical concepts and tools can come in to resolve it. Many students fail to answer complex math problem is due to their lack of capacity to visualise hence making difficult for them to estimate the scale and its mathematical relationship. The model approach helps student especially in early elemental levels to understand mathematical relationship between various entities. It is one of the most recommended technique to be taught in Singapore.